As an Intervention Specialist, I understand the importance of assessing my students on an ongoing basis. 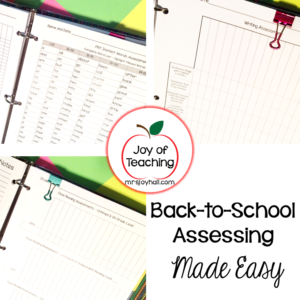 It can be overwhelming at the beginning of a school year to assess all of my students. I have their Individualized Education Programs (IEPs), but they are often not at that level due to the dreaded summer slide. I believe the best way to teach ALL students is to begin at the level they are at currently and take them as far as possible. In order to do this, however, I need to know what their current skill levels are. That’s where my Assessment Binder comes in handy! The Sight Word Spelling Test I give is from a list of words included in our phonics program, Phonics First, which is based on the Orton-Gillingham multisensory instructional techniques. If a student can correctly spell a word, it is a good indication that they know that word. I use Fry’s word list to check their sight word identification. This is time-consuming, so I only assess this 2 or 3 times a year. I also do running records and check comprehension using ReadingA-Z’s benchmark books. I do this so that I can assign them a level on Raz-Kids, which drives my instruction tremendously while simultaneously giving me great data for progress reports. The ReadingA-Z site provides a correlation chart, so I am easily able to inform team members what DRA, Fountas & Pinnell, Reading Recovery, or grade level the student is, as well as their A-Z level. I prefer to use the A-Z leveling system, because there are more than 26 levels that range from kindergarten to fifth grade…and my students need to be able to show growth, no matter how small. I create a cloze reading assessment (a paragraph or two with fill in the blanks and a word box) by copying from grade level trade books. I try to use high-interest passages, to entice them to want to continue reading. For a writing assessment, I created a checklist that I can use with any writing sample. I am able to give them a writing prompt or use a journal entry to check their writing skills. Writing is the most difficult subject for all of them, so the checklist works well. Click here to purchase the spiral math assessment pictured above. For math, I use spiral math assessments. 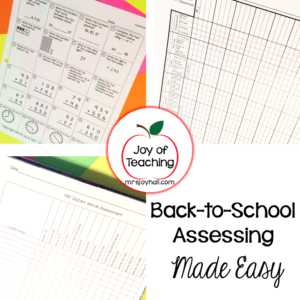 Each assessment covers the same skills, allowing me to truly track students’ progress throughout the year! They cover ordering numbers, place value, rounding, addition (with and without regrouping), subtraction (with and without regrouping), telling time, elapsed time, fractions, and word problems (both single-step and multi-step). I also like to test their basic fact knowledge, which I do with the help of an iPad app. I have to rotate them through the iPads (I have 3 to use at school), but it is worth it for me to NOT have to grade those things! Whew, is it ever a scorcher in Ohio today. I’ve been keeping cool staying in the A/C working on my British literature homework (Beowulf, anyone?) and browsing Facebook. My last foray into Facebook land left me feeling deflated and anxious. I have “liked” several teaching pages over the years and they have taken over my feed lately. Since it is nearing the end of July, most (if not all) are posting about Back-to-School. School supply bargains. Dollar store ideas for the classroom. Flexible seating ideas. Classroom painting, decor, and basic sprucing up. More ways to spend your own money for your classroom. First week of school activities. Big teaching ideas and plans for the upcoming year. So many teachers are simply oozing with their excitement for going back to school. Not me. I don’t want to go back! And you know something? That’s okay! It doesn’t make me less of a teacher. It doesn’t mean I don’t care for and genuinely love my students. I do. It doesn’t mean I don’t want to be the very best teacher I can be. I do. It doesn’t mean I will be less prepared for the start of the year. Trust me, I will be. All it means is that I realize that I have just a few weeks left before I am required to go back to school. I am about halfway through my teaching career. I teach students with special needs. It is exhausting. I need this downtime in order to continue to give my students what they need during the year. I’m refueling. I also have two incredible kids of my own. Summer is for them. For US. Summer is when we take long walks, spend days at the library, or go visiting every single playground in the area. We have water balloon fights and build forts. We read books and take naps in the middle of the day when it is too hot to be outside. We watch movies and complete 4-H projects. We laze around just chatting with glasses of lemonade. We go to the drive-in every chance we get. Our county fair is next week and we will have a blast. This is my favorite time of the year because of them. I am so very lucky to get to spend these days with a four-year-old who never fails to make me laugh and a ten-year-old who always makes me think a bit deeper. They will never be this age again and I wouldn’t miss it for the world! So to all of you teachers who are feeling guilty for not being ready to embrace the Back-to-School frenzy: IT’S OKAY. Your classroom and students will still be there. Maybe you are enjoying little ones, too. Or maybe you don’t like your current teaching position (or principal or coworker) and dread going back. Or maybe you, too, are still recuperating from the last group of kids who you gave your all to. Your reason doesn’t matter. It doesn’t make you a bad teacher who should find a new career. It just means you are not willing to let the frenzy eek into you…yet. It means you aren’t giving any of your hard-earned time off back to your job – for free. And to those of you who say you will feel behind if you don’t start now: Does that actually work? From the first day I step back into the school building I feel at least six months behind. Every. Single. Year. Even the years I prepared ALL summer. No more! I am taking back my whole summer and I am not accepting any guilt for not wanting to go back to school. Not any more. 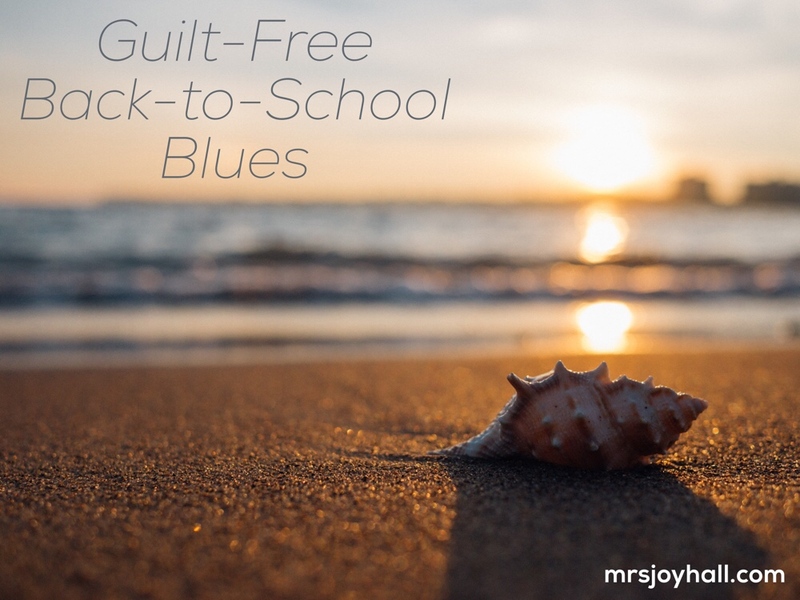 I have Back-to-School blues and I refuse to feel guilty about it! Now I am off to curl up on the couch beside one of my boys to watch Battlebots and listen to him talk endlessly about his plans to build fighting robots when he grows up. We’ll stay up late talking into the night until my eyes start to burn from exhaustion. And when I am awakened tomorrow morning at 7AM by my other little boy and forced to play Legos while feeling groggy, all I will be able to think is how much my life is blessed during the summer. You know, when I was an undergrad dreaming of making a difference in the classroom, I had no idea that a simple school supply could make such an impact in the classroom. Seriously. No idea. Now I know better. Let’s just talk about pencils for a bit. WHERE DO THEY ALL GO? How can a student start the day with 20 pencils and have NONE by 1:00? HOW? Are they being used as emergency snacks? Are they planting them in the grass during recess? And the kids who manage to hang onto their pencils NEVER have them sharpened! 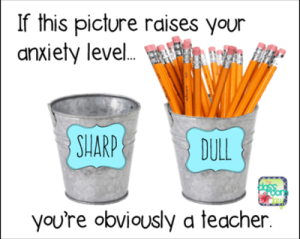 The constant noise of the sharpener drowning out the math lesson is a major annoyance to teachers everywhere! I finally started providing a “community” supply of pencils that are not to be taken out of my room. I sharpen them with my trusty little electric sharpener a couple times a week after the kids go home. It takes FOREVER. I has to take a break and cool down after sharpening two to three pencils. Truly.Annoying. 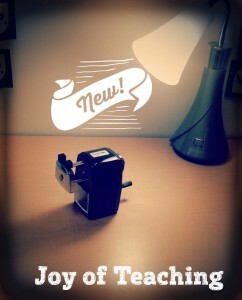 Then a few weeks ago, I received a new pencil sharpener to try out and review. Now, I’m not going to lie to you, I was none too excited to try out a crank sharpener. (Oh, the blisters!) But, this was not like those old sharpeners bolted to the walls. It grips the pencil and lets you know when the pencil is sharpened (the crank spins with no resistance). It is definitely quieter than traditional or electric sharpeners. AND it does the absolute BEST job sharpening of any sharpener I have ever used! These points are wicked, people. I may have had to go over expected classroom behaviors after sharpening pencils. The students immediately wanted to use them as swords. The kids love it so much that they will bring me hoards of pencils to sharpen for them (I am not yet ready to let them use it! ).